Medisoft Cloud is now available for Medisoft 19, 20, 21, 22, and 23. For medical practices looking for affordable medical billing software, we are here to help. We offer affordable Medisoft pricing to qualified customers. You can buy Medisoft online for your convenience. We know how valuable time is in healthcare and we take our role seriously in helping medical practices with their practice management needs. Would you like to cut your Medisoft IT costs by 50%? We are pleased to announce a new Medisoft Cloud server hosting solution starting at $125 per month. You can have 24/7 secure remote access to your Medisoft application from a secure cloud server. The solution is simple and affordable lowering your IT costs significantly. Eliminate the high costs of upgrading and maintaining a dedicated server. 2K Medical's new Medisoft Cloud server solution allows you to run your practice while we manage your Medisoft IT on a fast, reliable and secure cloud server. 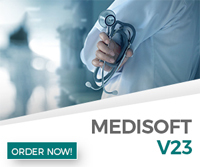 Medisoft 23 is now available. Medisoft Version 23 includes Customizable Timely Filing Calculator; Additional AR Tracker Enhancements; Revenue Manager Remittance Auto-Posting Now Shows Secondary Status; Auto-assign Statement Notes based on Remittance Code; Insurance Card Scanning to policy and multimedia tabs; Advanced Duplicate Patient Record Matching and Reporting Best Practices Documentation. With each new release it gets better and more powerful as new layers of functionality and usability are added. 2K Medical has partnered with some of the leading medical billing companies in the industry to provide Medisoft medical billing services . Our revenue management services specialize in utilizing your popular medical billing software to maximize insurance claim reimbursement. . A typical practice leaves up to 30%* of its revenue on the table each year due to inefficient billing practices. You can no longer afford to continue with "business as usual." It's time for a new solution that will provide the expertise, smart tools, and technology to help you thrive in this dynamic market. Our revenue cycle management services can help you get it back. As a National Value Added Reseller of Medisoft we can improve your cash flow, improve reimbursement, and increase your bottom line. We have developed direct electronic claims software for enabling faster payment of claims. Our services specialize in utilizing your existing medical billing program to maximize practice revenue and billing performance. Imagine the ease and convenience of submitting all your claims electronically with full on-line audits and edits right from billing information. We can help you develop and implement billing and collection improvement strategies that are designed to minimize accounts receivable (AR) days, reduce denials and optimize collection results. Medisoft is an industry and market-leading solution used by more than 70,000 health care providers that improves cash flow and increases office productivity, all at a value that respects your bottom line. Medisoft© powered by eMDs is a proven, trusted, and affordable practice management solution designed to simplify the way you run your practice. When it comes to patient receivables this product provides the necessary features to help physicians and billing services manage patient payments. This complete patient accounting system typically costs much less than other systems. Medisoft Software simplifies health insurance billing. For healthcare offices looking for a flexible and efficient way to keep track of patient appointments, Medisoft Office Hours offers an ideal scheduling system. The Office Hours appointment scheduler is simple patient scheduling software. As insurance companies continue to squeeze the revenue going to providers, you must find ways to stay profitable. this medical practice management solution will help you automate a number of processes, keeping your office profitable and independent. Patient data entry is fast and simple. The billing histories can be available through advanced reporting. The powerful workflow engine helps clinicians manage scheduling, billing, and revenue cycles. The system is designed to help you accurately create patient statements and payment plans. For medical practices that want the practice management features of Medisoft 23 at an affordable price, Medisoft Clinical is a full electronic health record system created for smaller medical practice. MedisoftClinical® offer a comprehensive suite of tools that help you run a modern practice while delivering superior care. Whether you need flexible scheduling and billing, or advanced clinical capabilities - this electronic medical records software offers the technology you need without the complexity you don’t. Designed to help small and growing practices thrive in an ever-changing healthcare world, thistechnology is fine tuned to help you work faster and smarter – freeing your practice up to spend more time on patients instead of paperwork. The software requires windows operating system. Medisoft Clinical brings a comprehensive electronic health record solution into the mix, building on the Medisoft system to enhance clinical capabilities. Together, your practice gains the right tools and proven software to work smarter, not harder. Customize practice reporting to get the data you want, without extra clutter. Reduce time spent on data entry with chart automation features that make charting a breeze. Instantly understand system design with a familiar paper chart based layout. Exceptional features by design. Certified by eMDs Practice Solution as a Value Added Reseller, 2K Medical Software is a certified reseller of Medisoft Software and electronic medical records software. 2K Medical Software also provides the training, data file repair, data conversions and other support needed to adapt the electronic medical records as well.